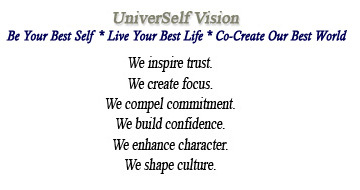 UniverSelf provides breakthrough strategies and everyday solutions for succeeding in life and work. Extraordinary is Mandatory at UniverSelf. Transform your life so you are happier and wealthier; inspired by passion and aligned with your purpose. UniverSelf Purpose: Your potential is our passion! To facilitate "Universal Self Leadership" we equip and encourage every person to create an extraordinary life of personal greatness and passionate service for their families, workplaces and communities. By helping at least 1 million people create their dream life and workplace, we create global 'quantum shift' for billions more. UniverSelf Mission: We help every client create lifestyle and leader greatness through quantum coaching, teambuilding, management facilitation, and leader-organization development. UniverSelf, leads human transformation, serves leaders and workplaces by 1) ending core belief and strategy limitations, and, 2) enhancing life and leader effectiveness. We maximize the unique talents and life purpose of every client, and elevate 'goodwill-consciousness' worldwide. UniverSelf Serves: Fortune 500 and start-up business entrepreneurs have included advertising and marketing firms; telecommunications and IT companies; electrical and communication contractors; the film and TV community; legal firms, artists, small business owners and boards. Our work is foundational, ground-breaking and award winning because it's practical, targeted and client-centered. Our skills training and process facilitation integrates leading-edge research from the best and the brightest including Integral Institute, Franklin Covey, Ken Blanchard, Tom Peters, Jim Collins (G2G), Pat Lencioni (Team Dysfunctions), John Assaraf and Murray Smith (One Coach), the International Coach Federation (ICF) and Organization Development Network (ODN); East-West wisdom traditions, and the newest brain research and energy medicine discoveries. As a business owner, professional speaker, team facilitator and hands-on educator, Deb Holt has held executive and management positions in national retail and international telecommunications companies, and within a university. She holds a Master's degree in Organizational Communication and Human Relations (Organization Development). She is the President of Heartland OD Network (HODN); and member of International Coach Federation (ICF) - Heartland Coaches Alliance. The Univerself Results: We guarantee immediate and sustained improvements in your life and workplace. You get happier. Work gets easier. Life gets better.